Wooded or bushy areas, or areas with leaf litter and high grasses . Walk in the main center of trails. Make sure to check yourself and your pets frequently during and after your walk or hike. When hiking or walking in wooded or grassy areas, make sure to spray all exposed skin, as well as your clothing, with insect repellant. You may also treat boots, socks, pants and clothing with a product that contains permethrin. It remains protective for several washings. 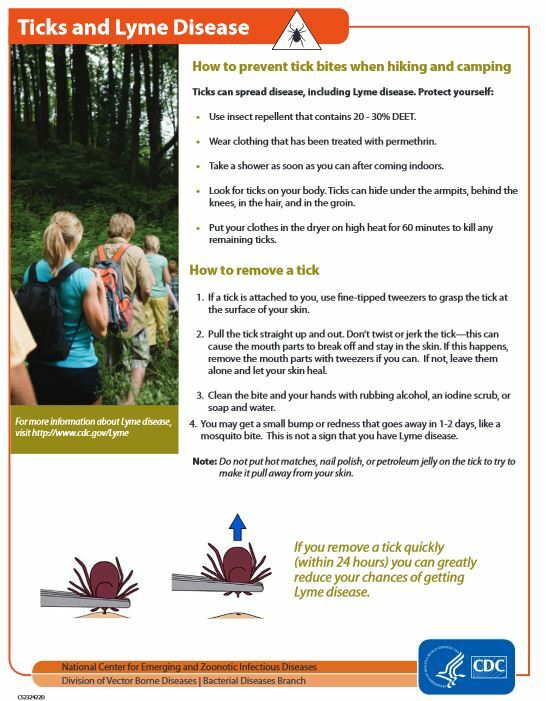 These ticks that carry Lyme disease is extremely hard to see since they are very small. After returning home, remove your clothes and thoroughly inspect all skin surface areas, including your scalp. Shower soon after coming indoors to wash off any unseen ticks.